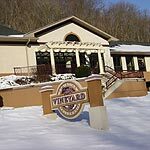 The congregation of the Vineyard was founded in 1979 and is comprised of Christians whose stated mission is to "help people find and follow God." The Church places a high priority on creating an atmosphere of openness and flexibility. The Vineyard movement was founded in California in 1977 and has grown quickly through a commitment to "church planting" and now includes over 600 churches nationwide.